The main creative forces behind the Indiana Jones series – director Steven Spielberg and producer George Lucas – found themselves in something of a pickle when they went back to make Temple, the first sequel to Raiders. Actually, it’s the same challenge that confronts all sequels. Viewers want something that doesn’t just repeat the first movie but that doesn’t vary too much from the original’s action. I’ve like Temple, but I will acknowledge that it remains my least favorite of the original three Indy flicks. Part of the problem comes from the fact it seems to try a little too hard to differentiate itself from Raiders. It feels like the filmmakers worried so much that they’d just remake the original that they went too far in the other direction. That means that in place of the gritty and assertive heroine Marion Ravenwood from Raiders, we get the screechy, spoiled and hysterical Willie. Many people don’t care for the character and see her as a regression due to her selfish and whiny personality. The insertion of Short Round feels somewhat gratuitous and doesn’t serve much purpose. Did Indy really need to become a parental figure just because the film involves enslaved children? No. The sidekick character remains largely superfluous. It seemed almost inevitable that Indiana Jones and the Temple of Doom wouldn’t quite live up to its predecessor; Raiders proved to be a genre-defining classic with no peers. Temple is more erratic and less satisfying, but it generally delivers the goods. The flick provides a consistently dark atmosphere that makes it the least accessible of the first three movies, but it mostly works and seems like an interesting adventure. The setting in India offered a nice mix of hues, and the DVD replicated these well. Raiders looked slightly dense at times, but that tiny issue didn’t arise during Temple. Instead, the colors consistently came across as vivid and vibrant, with no signs of bleeding, noise, or other distortions. Quite a lot of red lighting cropped up, and the disc handled those instances with aplomb. Black levels were deep and rich, and low-light shots appeared clean and appropriately defined. Much of the flick looked very good, but the sporadic softness made it a “B”. Audio quality almost never showed its age. Speech was nicely natural and distinctive; with no edginess or issues connected to intelligibility. Unlike Raiders, looped lines blended smoothly. John Williams’ score remained tight and vibrant, as the music sounded quite well produced and dynamic. Effects showed virtually no signs of distortion, as they were concise and accurate. Bass response wasn’t quite as impressive as during Raiders, but the film included plenty of deep and firm low-end material. Temple lacked some of the highs heard during Raiders, but it also avoided that flick’s minor issues. That meant Temple earned an identical audio grade of “A-“. How did the picture and audio of this 2008 Special Edition compare with those of the original DVD from 2003? Both looked and sounded identical, as clearly the two releases resulted from the same source. I did think compression was slightly better on the old disc since it didn’t include any extras, but the variations between the two seemed minimal. The 2008 SE includes new supplements, however. 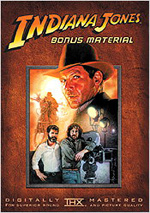 The 2003 version came as part of a four-disc package; along with the other two Indy flicks, a fourth disc of extras appeared. None of those components pop up here. Instead, the 2008 SE mostly focuses on new featurettes. The Temple of Doom: An Introduction runs five minutes, 58 seconds and provides comments from director Steven Spielberg and story writer/executive producer George Lucas. They tell us a little about the project’s genesis, its darkness, and some aspects of its creation. A few interesting notes emerge here. In the 11-minute and 54-second The Creepy Crawlies, we hear from Spielberg, executive producer Frank Marshall, animal wrangler Jules Sylvester, and actors Harrison Ford and Karen Allen. "Crawlies" looks at the Indy series’ use of unsettling critters like snakes, insects and rats. We learn a lot about how movies feature these creatures as well as their specific "performances" in the films. It becomes a surprisingly informative piece. Next comes Travel With Indy: Locations. The 10-minute and 30-second show includes Ford, Marshall, Allen, and producer Robert Watts. As you probably guessed, "Travel" looks at the locations and sets used for the different Indy films. We get more informative material in this compelling program. Next we find Storyboards. This two-minute and 31-second reel shows drawings created for the "Mine Cart Chase" sequence. We see the boards in the upper two-third of the screen with a small frame to show the movie at the bottom. The comparison format works well and gives us a good look at the scene. Under Galleries, we find four subdomains. These cover "Illustrations and Props" (52 images), "Production Photographs and Portraits" (118), "Effects/ILM" (40) and "Marketing" (34). I liked all of these sections, though the "Marketing" bits were probably the most fun. Seeing all those ads really brought back just how excited I was to see Temple in 1984. Some promotional materials for Lego Indiana Jones: The Original Adventures arrive on the disc. In addition to a game trailer, we get a link to a PC Game Demo. I wanted to give this a try, but as I write this review, the link isn’t yet active. 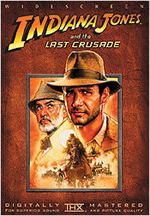 The DVD opens with a trailer for Indiana Jones and the Kingdom of the Crystal Skull. No ad for Doom appears here. Indiana Jones and the Temple of Doom doesn’t compare favorably with its predecessor, but what does? Temple acts as a mildly flawed but generally exciting and entertaining action flick; its main flaw is that it’s not an all-time classic like Raiders. The DVD presented terrific audio, generally good picture, and a few informative extras. Temple of Doom will always be my least favorite of the first three Indy adventures, but it remains an enjoyable piece of work that I recommend. 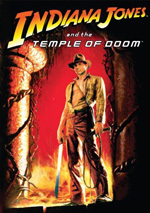 Note than you can buy Temple on its own or as part of a three-DVD "Indiana Jones Adventure Collection". 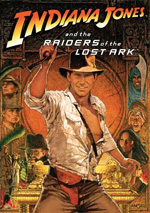 That set also includes Raiders of the Lost Ark and Indiana Jones and the Last Crusade. The "Adventure Collection" retails for $59.98, which makes it a good deal if you want all three of the movies; individually, they go for $26.98 apiece. One twist: the original 2003 Indiana Jones Collection remains on the market and now retails for $49.99. As you math majors already figured out, that’s $10 cheaper than this new set, and it also includes a bonus disc with extras absent here. Of course, this disc’s supplements don’t appear in the 2003 package, but I prefer the old release’s bonus materials to this one’s. If you only want to own Temple, this individual DVD is the way to go, but for fans who desire all three flicks, grab the old 2003 set instead of the 2008 package.